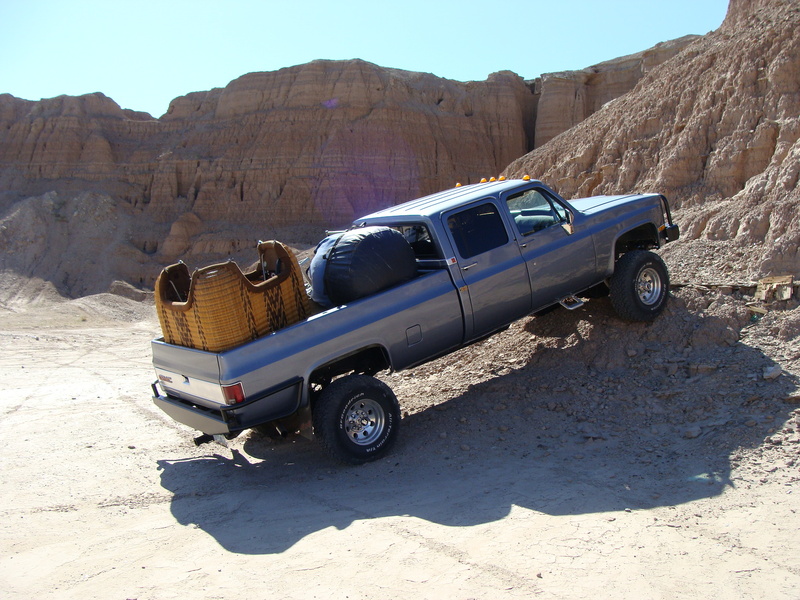 Our balloon chase vehicle is perhaps the toughest, most rugged chase vehicle we have yet to see. We have yet to find a balloon chase rig more capable than ours! So we felt that it deserved some mention and it's own page on our website! The chase vehicle is an extremely important part of any balloon operation. Since a balloon travels with the wind, a chase vehicle is necessary to retrieve us and take us back to our starting point after the flight. If the balloon flies past the last paved road, many companies and their 15 passenger vans are left to sit and watch their balloon fly off into un-retrievable terrain! This can mean a very expensive and lengthy retrieval for the company and for the passengers a major inconvenience! Some stock 4wd chase trucks might get a little farther along but our rig can keep going and we haven't encountered any terrain it can't get past yet. Our Gold Canyon and Lake Pleasant flight areas can sometimes have us flying into some rather challenging terrain and you can rest easy knowing our chase vehicle is close behind for a quick retrieve. In addition, your pilot and the Roping The Wind Balloon Team get out from time to time for unique adventure flights that have us flying deep into remote Arizona terrain and this is the primary reason for building such a tough vehicle. For our daily passenger flights, it is a comfort to know that if we should stray too far into rough terrain, our chase vehicle can make it to our landing site. By now you are probably wondering just what kind of a truck this is? 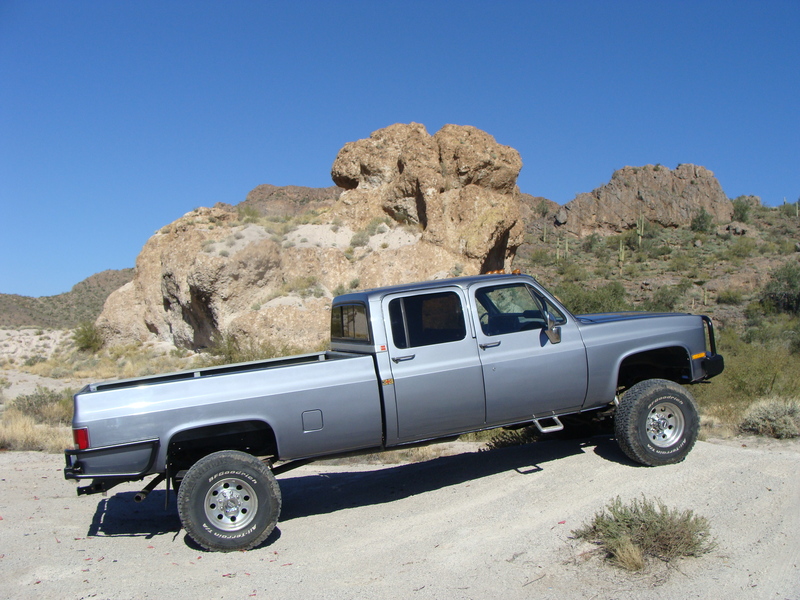 This vehicle is a completely restored 1981 GMC one ton crew cab 4x4 truck. 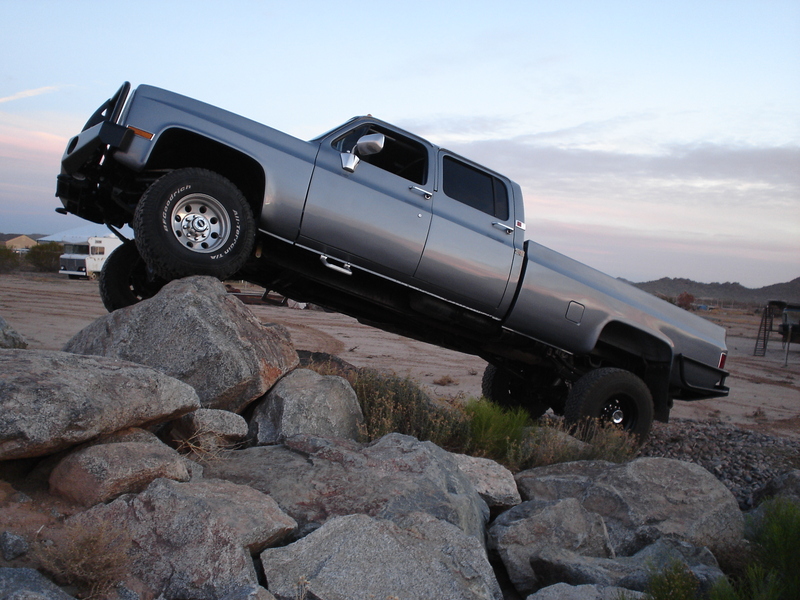 Some of the toughest full size off road rigs and rock crawlers are using components that came factory in these old Chevy/GMC 4x4 trucks from the 70's and 80's and are well known for being very capable trail rigs. Some of these components are very sought after in todays off road marketplace for use in rock crawling and extreme off road applications. In addition, we have gone above and beyond with heavy duty upgrades and modifications as well as many aftermarket options to make this an extremely capable crew cab truck. 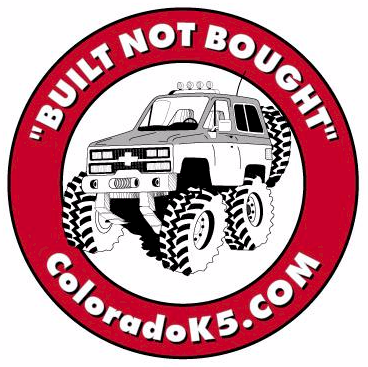 Your pilot enjoys off roading as a hobby and has been around the scene for many years and understands what goes into building a solid trail rig. The saying "They dont make em' like they used to" holds very true when it comes to most factory 4x4 vehicles. They may be more 'plush' nowadays, but are not nearly as capable and were never built to be abused off road! Today, the factories build a truck to have a better 'road ride' and handling. Though we concentrated on making our chase rig tough, we also 'plushed' the interior up a bit for your comfort during the ride back from our landing! Passenger safety is a high priority not only in the air, but on the ground too. Interior modifications include a full interior roll cage and seat belts for all occupants, including racing harness for driver and co-driver. Fire extinguisher, first aid kit, air compressor and tool set are also onboard. As you can see, we are very proud of our rig! Your pilot and his dad, a GM master mechanic of 55 years who today restores classic muscle cars, rebuilt this truck from the ground up during a five month rebuild project. This truck was featured in the July 2009 issue of Off Road Adventures Magazine and won the "Best of Before and After" contest! front HD leaf spring shackles, sway bar correction/disconnect kit (improves articulation in tough off road situations when disconnected and provides a better ride on road when connected), steering box/frame brace, front Dana 60 kingpin HD upgrade/rebuild kit, and HD brake lines (4 layered: tough teflon core, kevlar braid, stainless steel braid and outer vinyl protective layer). 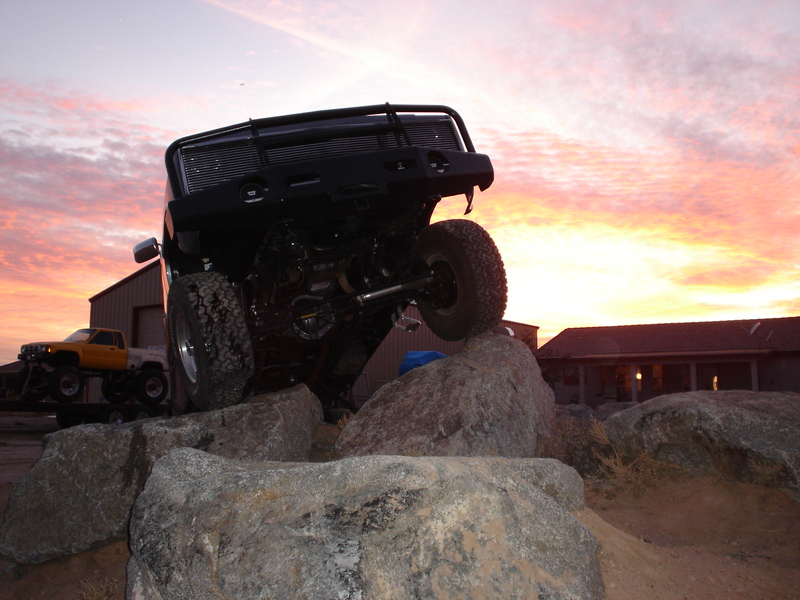 4 Wheel Parts is the source for many parts and accessories for our rig! Off Road Design is the source for many heavy duty off road upgrades for our rig! They cater mostly to Chevy/GMC 4wd solid axle trucks of the 70's and 80's.